Barbara Hole (Brown Owl) retiring in 1968. Evelyn Doble making a presentation to Barbara Hole on the occasion of her retirement as Brown Owl in 1968. 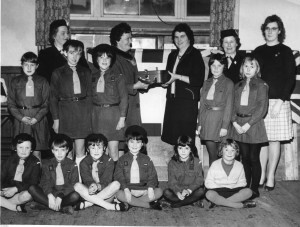 The next Brown Owl, Janice Fuller, is standing on the right. 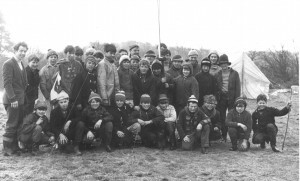 A scout meeting in the Church Rooms in 1967. 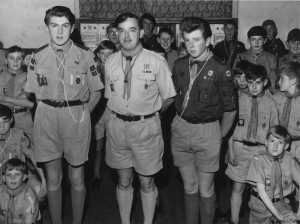 Skip Lowman flanked by senior scouts Brian Milton and Martin Pring. Operation Snowdrift c. 1966. This was at Wrangway near the Wellington Monument. 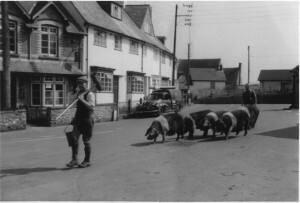 Five heavily pregnant Wessex Saddleback sows being driven through the Square in the 1960s, notice the man in front is carrying a bucket and broom to ensure that the road is kept clean! Lloyds Bank on the left was still operational, this was before Egypt House, (centre right) was demolished to provide a village car park. Aerial View of Clum Davy House and Grounds. 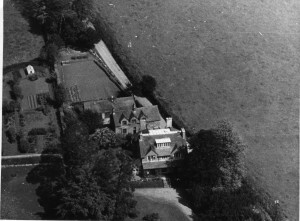 An aerial view of Culm Davy House and grounds, believed to have been taken in the 1960s. 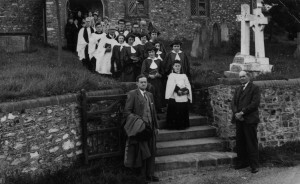 Rogation Day at Culm Davy Chapel in 1960. 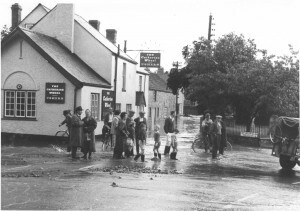 Rogation Day at Culm Davy Chapel c.1960. The Churchwardens either side of the gateway are Mr.
Culm Valley rail line 1963. Clearing the line of snow in 1963. 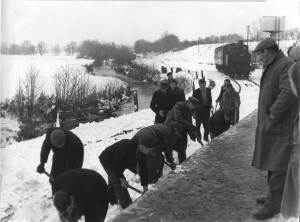 Factory Workers clearing snow at Hemyock Station. 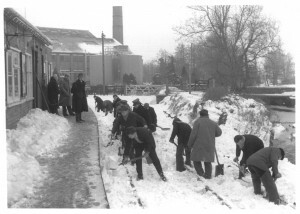 Milk factory workers clearing snow from the rails beside Hemyock Station in 1963 to enable the train to reach the factory and take the milk away. The factory had converted to oil to fuel the boilers and the oil storage tanks can be seen in the background.